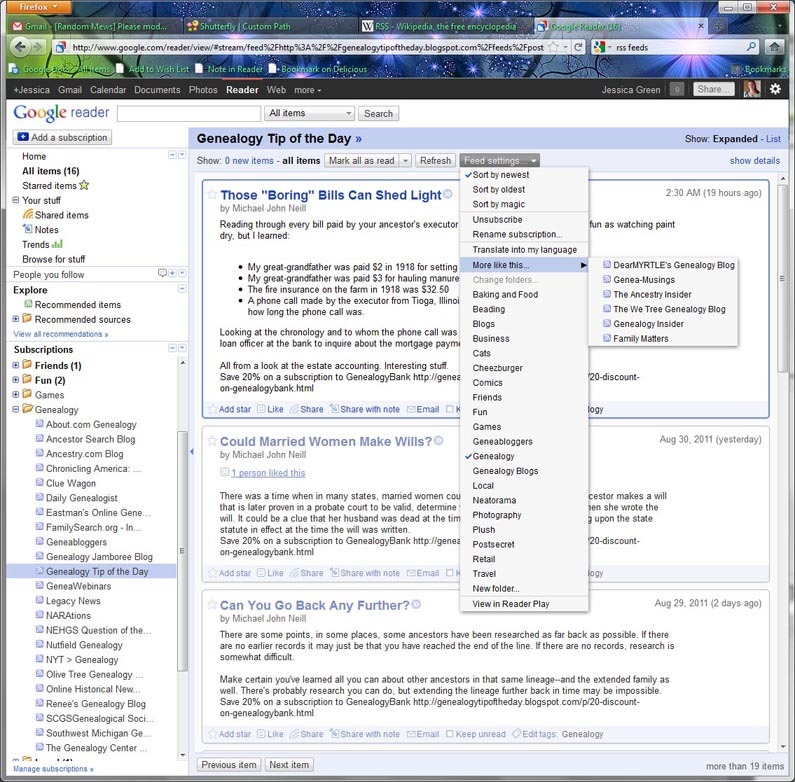 Tech Tuesday – What is an RSS feed? 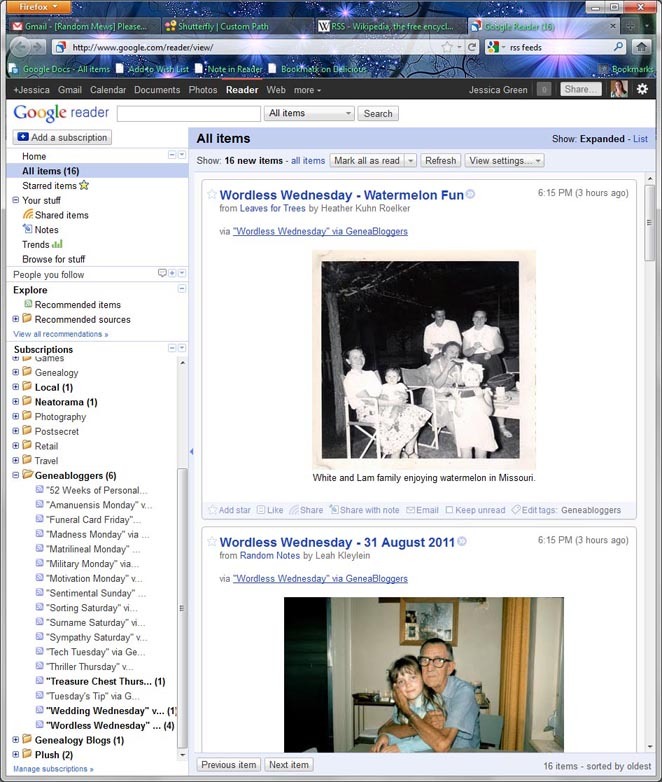 What is RSS and how can it help you organize all the genealogy blogs you like to read? Let’s find out. RSS is a web syndication platform. Simply put, it “feeds” information to you that you wish to see. You may have heard “RSS feed” or “web feeds” when looking at some of the blog content. The most popular RSS readers are Google Reader and Feedburner. Both of them are now owned by Google. I use Google Reader and it works perfectly. Let’s say I want to “subscribe” to your blog (or any website, for that matter). I simply paste in the URL to the website I want to get “fed” content from. For example, the URL for my website is http://www.jessicagreen.com/wordpress. If you “subscribe” to that URL in your feed, anytime I post new content here it will show up in your reader program for you to enjoy. This includes text, pictures, audio, video and any other type of content that is posted. The RSS reader will standardize the format (sometimes in a good way, sometimes it can mess things up!) and present it to you in an easy to review stream of posts, kind of like reading through your email. If you’d like to visit the site, simply click on the title in your RSS reader and it will take you there in your browser. 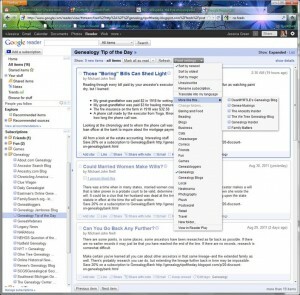 Google Reader allows you to group your feeds together into categories which makes it easy to organize your content. I have groups for many of my favorite topics that I enjoy reading about, such as Baking, Crafting, Photography and Travel. You can also take bundles of feeds that other people have shared and add them to your reader. As an example, I have a category called “Geneabloggers.” That category has a whole bunch of feeds in it that automatically show me all of the Geneabloggers topics that I am interested in, such as Tombstone Tuesday and Sentimental Sunday. I don’t have to go to those blogs individually to see the content – it is “fed” to me via RSS. To get started, simply create an account on Google Reader. If you already have a Gmail account, then look up at the top of your inbox and you will see a link to Reader in the top menu bar. Then, you can subscribe to my dear friend Sarah’s Genealogy News and Blogs bundle which she has kindly shared with the world. You may also wish to subscribe to my bundle of Geneabloggers Prompts. There are just a few in this bundle; dozens more are also available on the Geneabloggers website. Don’t forget to add their website to your feeds as well! Once you have subscribed to the websites or bundles you would like to receive content from, reviewing them is very similar to perusing your email inbox. Once you read an item it will be marked as read. You can use your up and down arrow keys to move from one item to the next, or the keyboard shortcuts (use “J” to go to next, “K” to go to previous). I’ve attached a few screenshots of how my Google Reader is set up so you can see an example. It’s really excellent for reviewing massive amounts of online content quickly. Did you know you can get lists of “Recommended Sites” based on what you read every day? You can also choose a particular website feed click on it to read all of the content from that website. Select “Feed settings” and show “More like this” and it will give you links to other sites that are similar to that one. It’s amazing! If you’re already accustomed to using RSS feeds to review your favorite blog content, then you know Geneabloggers is an absolutely incredible resource for the blogging community. If you aren’t a member, you’re seriously missing out! Their site makes using RSS feeds incredibly easy, because they have done all the work for us already, and deserve many thanks! You can send your thanks via any amount of monetary Donation right from their website using Paypal. With that in mind, do you know how to take full advantage of the Geneablogger prompt roll-up widgets? 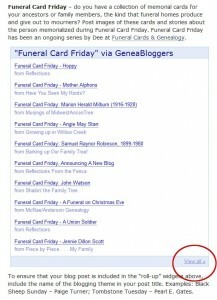 Let’s say you want to automatically get “fed” in your reader every blog post for Funeral Card Friday. In the prompt post, there is a button at the bottom of the feed that says “View all” that you click on. 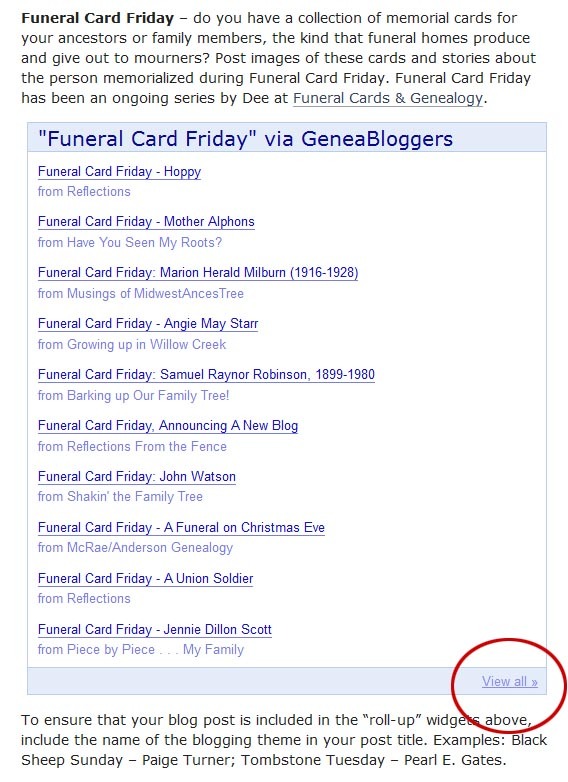 The URL that it takes you to will be the one you put in your RSS reader to “subscribe” to (for example: http://www.google.com/reader/shared/user/16209268016599136195/label/Funeral%20Card%20Friday). Now, anything that shows up in the Geneablogger “roll-up widget” will show up in your feed. It’s that simple! Once you add all the feeds you want to see, everything will be delivered in a nice little organized package right to your RSS reader. You can spend more time reading all the wonderful content put out there by all of our fellow bloggers, and less time searching for it. I hope that helps you understand a little more about what RSS is. It’s a tool that no genealogist who enjoys reading other genealogy blogs should be without. I’d also like to thank fellow Geneablogger Patti who prompted me to write this post. Visit her lovely blog, Fill My Cup…with Beauty to read about her genealogical journey.